Climbing down from the high places on the Rock, I view an ongoing war in the valley. 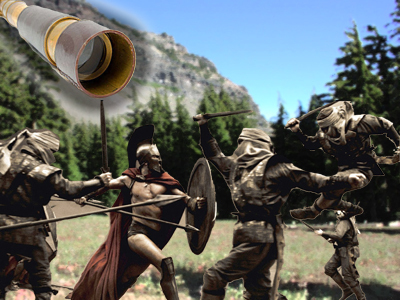 I take the spyglass from my belt to view each battle being fought. This new way of seeing close up is a gift from my Father. In His presence I quietly listen to His lessons, learning to examine the art of war. The strategies are nothing less than simple. Alone we are taken down one by one. Only when we unite ourselves to battle as one will we gain victorious ground.